Most damage to a property during severe weather occurs when limbs or trees fall. High winds occurring during thunderstorms can cause tree roots to fail and branches to weaken, resulting in power outages, property damage, and even personal injury. None of this is an easy experience for a homeowner. That is why pre-storm strategies are recommended to identify potentially hazardous conditions and to help reduce the risk of damage before harsh weather occurs. In many cases, hazards are not always obvious to the untrained eye and correcting them can be a dangerous job. While it is impossible to totally protect your trees and property from severe storms, a certified arborist can inspect for issues that could predispose trees to failure. This could include a climbing inspection or an analysis of decay that may be present in the branches, stems or roots. Based on what is found, appropriate treatments can help trees and shrubs better endure weather events. When there is an issue with the tree’s structure, installation of cables or braces can help the tree’s ability to withstand high winds. Pruning can also help with this and it is essential for removing any dead or hanging limbs that may pose a threat. Never utilize the services of an arborist that proposes topping as a solution to storm damage prevention. Topping leads to problems later in the life of the tree and is prohibited by industry standards. 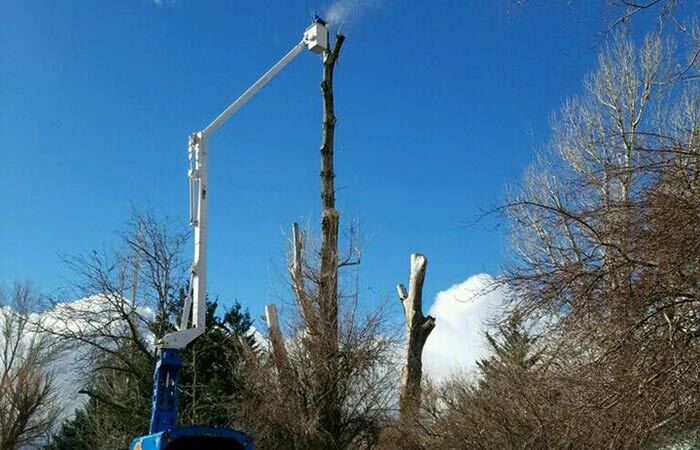 Additionally, an arborist should not use climbing spikes when performing maintenance procedures as they create wounds that can lead to insect and disease infestations. Also be wary of a tree service that recommends removal without reason. Trees provide beauty and add value to your property so removal should only be considered where high-risk conditions exist that cannot be effectively mitigated. Even if you routinely care for your trees, when a severe storm hits, be sure to have an arborist review your property for any issues resulting from the weather.